Luxury brands are very common nowadays, but a few years ago things were a little bit different. Luxury branding design was not an important task at the begining, when aristocrats and the upper class knew perfectly where the best Parisian shops were placed… In 1700 luxury branding design was as simple as the craftman surname over the door of his shop. That was enough for the moment. Products and reputation were the real brand. Things were easier for luxury brands in the good old days, they were only a few, and they were worldwide known. It wasn’t until 1760 that the old luxury market started disappearing. The industrial revolution changed everything. Upper class grew very quick, so luxury product demand grew in the same proportion. Craftsmen realized that luxury good production was a great opportunity. Therefore, this quiet old market became a jungle in the twinkling of an eye. The competition became harder and harder. Products and reputation were not enough in this overcrowded market. Luxury companies needed symbols to make easier to recognize their products. They just wanted to differenciate products that, actually, were pretty similar. 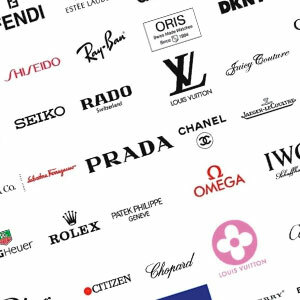 First brands were typographical ones, but they realized that all brands were very similar, so they hired artists as luxury branding designers to create the first modern luxyry brands. A few years later graphic designer become a professional job and they replaced old artists. Trends and artistic movements have defined luxury brands over the years. Art Nouveau, Art Deco, Surrealism, Vanguards, Modern Design… Having a look at the classic luxury brands it’s easy to keep the track of the evolution of artistic movements. Art was cool, art was only for upper class… But here comes the next revolution, this time was an artistic one, called “Pop Art”. Pop Art opened the Pandora’s box in luxury branding desing. Since that moment, art left upper class status and moved to middle class. In the 60s luxury brands lost their lighthouse. Since that moment we are immersed into an eclectic mixture of everything. There’re no rules for luxury branding design. Far from being a problem, this fact is an incredible opportunity for designers because it gives complete freedom to design whatever they want. On the other hand, this lack of rules or knowledge has unchained a wave of luxury logo designs and brands that make it harder to differenciate them. The competition continues, let’s try it harder, we’re not afraid.